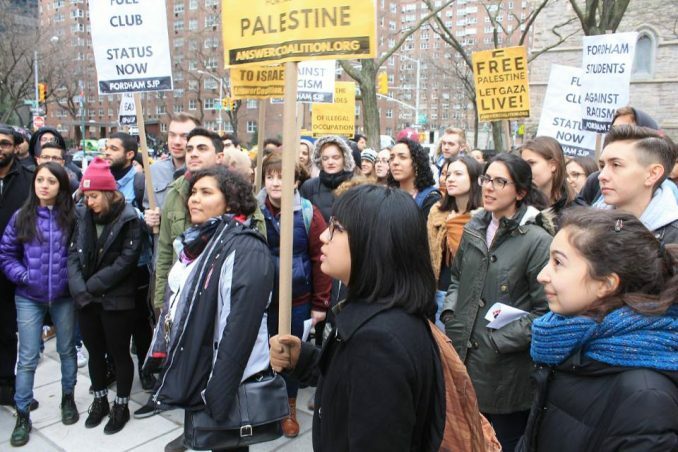 Palestine solidarity activists and students protested Jan. 23 at the Fordham University campus in New York City’s midtown. The crowd of 40 to 50 people gathered to oppose the school administration’s discriminatory ban on a campus chapter of Students for Justice in Palestine. The ban comes after a year-long struggle to build the local SJP chapter, voted into existence by the Fordham student government. 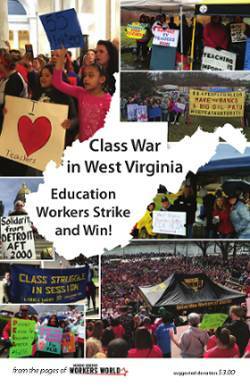 Permission for the chapter was denied on Dec. 22 by Dean of Students Keith Eldredge. He specifically cited SJP’s political goals, including support for the BDS movement for boycott, divestment and sanctions against Israel, as one reason for the ban. During the past year, students working to form SJP have been summoned to hearings by the university and the student government. Asked about their intent as a group, they were questioned about their position on other groups such as J Street, a Zionist organization, and Jewish Voice for Peace, which is against Israeli settlements in Palestine. Students and activists addressed the hypocrisy of Eldredge’s claim that a Fordham SJP chapter would be “divisive and provocative.” Speakers retorted that the Israeli system of occupation of the Palestinian people is not only “divisive and provocative,” but an act of ethnic cleansing and national genocide. After the rally, protesters spontaneously marched to Columbus Circle to bring awareness of the situation, and of the larger issue of Palestine’s liberation, to the surrounding community.